The Web Platform Installer from Microsoft is a cool little "installation bootstrapper" that makes it very easy to install many .NET platforms and tools- both from Microsoft and 3rd party- with a few clicks of a button. It's a free tool and it's sole purpose is really just that: make it dead simple to install and configure .NET developer software. I use the Web PI (as it's called) almost elusively these days to install software like SQL Server 2008 Express, SQL Server Management Studio, ASP.NET MVC, and other Microsoft platform components. In fact, I've got the Web PI running right now on two new VMs installing fresh copies of SQL Server 2008. A new option has recently been added to the installer, though, and you can now install Telerik's Sitefinity Community Edition directly from the Web PI (right along with your other Microsoft software)! Sitefinity CE is available at no charge to the .NET community and can be used for both hobby and commercial websites. 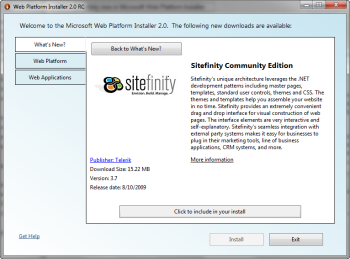 As part of the WPI, it will now be easier than ever to install and use Sitefinity for all your .NET CMS needs. Not easy enough for you? Sitefinity Evangelist Gabe Sumner has gone a step further and actually prepared a video showing you exactly how to use the new WPI feature. So, no more excuses. Give the WPI a try and install Sitefinity this weekend!